While working in your courses, you may find that you can’t see some of the links or images in your instructor’s content. Or, you may find that, at times, you are prompted to “allow mixed content” or accept that the browser “display non-secure content”. This is because the instructor may be linking to non-secure elements in the course modules, assignments or other materials. Insecure content refers to content that is located on http servers, as opposed to https servers, like Etudes. 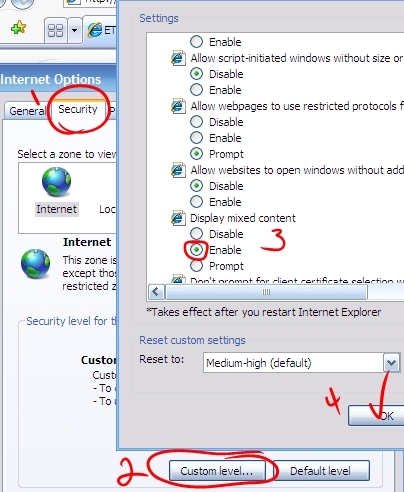 To adjust your browser’s settings to allow mixed content in your courses, follow the below instructions. 1. 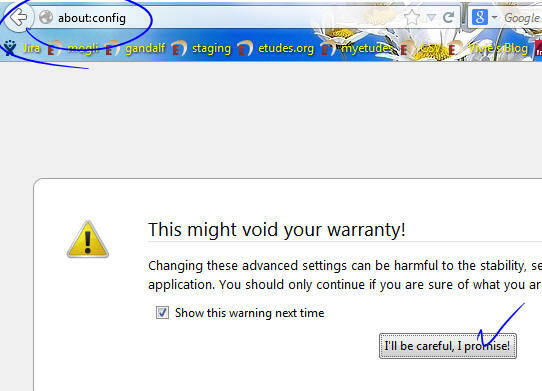 Type about:config in Firefox’s address bar. 2. Click on the Custom tab. 3. Then scroll down to the Miscellaneous area, and enable “Display mixed content”. You will need to restart IE. Now, nonsecure content (http://) used in course sites will always be displayed on our secure Etudes servers. When a page has insecure content, the following shield icon will appear in the address bar. Click on it, and select “Load Anyway” or “Load unsafe script”. The video or other media will load. The URL in the address bar will show to indicate that the page is not fully secure, but it will load the content.